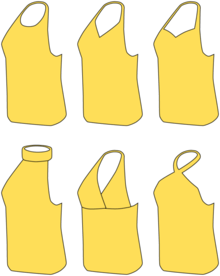 Various styles of halterneck attire. Halterneck is a style of women's clothing strap that runs from the front of the garment around the back of the neck, and leaving most of the back uncovered. The name comes from livestock halters. The halter style is used with swimsuits, to maximize sun tan exposure on the back and minimize tan lines. It is also used with dresses or shirts, to create a backless dress or top. 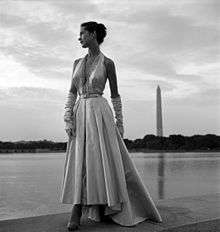 The neck strap can itself be covered by the wearer's hair, leaving the impression from behind that nothing is holding the dress or shirt up. If a bra is worn with a halter top, it is generally either strapless or of halterneck construction itself, so as to avoid exposing the back straps of a typical bra. A halter top is a type of sleeveless shirt similar to a tank top (by the American English definition) but with the straps being tied behind the neck. In another style of the halter top, there is only a narrow strap behind the neck and a narrow strap behind the middle of the back, so that it is mostly backless. This design resembles many bikini tops, although it covers the chest more and may cover some or all of the abdomen at the front. Look up Halter in Wiktionary, the free dictionary. ↑ "halter, n.1." OED Online. Oxford University Press, June 2016. Web. 18 June 2016. ↑ "Halter neck wedding dress". Archived from the original on November 13, 2012. Retrieved 2013-03-14.